WASHINGTON — Aspirant asteroid-mining company Planetary Resources raised more than $1.5 million in 33 days to launch a small space telescope into low Earth orbit in 2015, setting the stage for thousands of people to photograph asteroids, stars and their own self portraits from orbit. Planetary Resources, Bellevue, Wash., began a Kickstarter crowdfunding campaign May 29 seeking to raise at least $1 million by June 30. The company hit that goal June 19, then raked in another $505,366 in the final 10 days of the campaign, including $100,000 on June 30 from Virgin Group Chairman Richard Branson. The money raised on Kickstarter will be used to build an Arkyd-100 space telescope, a 15-kilogram pathfinder spacecraft Planetary Resources plans to use as the basis for future asteroid-prospecting models. Meanwhile, data from the Kickstarter analytics website, Kicktraq.com, shows that Planetary Resources raised an average of $45,614 a day, with the 17,614 donors contributing an average of $85 each. Planetary Resources raised roughly half of its $1 million base goal in the first two days of the Kickstarter campaign, according to Kicktraq data. The Arkyd-100 is not expected to be the first spacecraft Planetary Resources launches. In 2014, the company will pack the essential systems of the small space telescope into a triple cubesat — a standardized small-satellite design that is 30 centimeters long, 10 centimeters deep and 10 centimeters wide — called the Arkyd-3. Arkyd-3 will contain the Arkyd-100’s avionics and attitude determination and orientation instruments. The company has not identified a launch provider for the mission. Planetary Resources ultimately plans to send swarms of small spacecraft based on the Arkyd-100 to mine water, precious metals and other resources from asteroids that take no more fuel for a spacecraft to reach than the moon. The company also had been planning to develop a novel three-in-one optical instrument that combined imaging, star-tracking and laser-based communications. 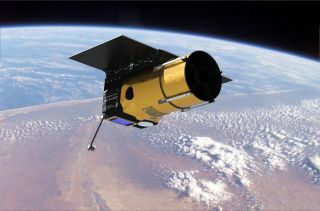 The instrument would not have flown on the Arkyd-100 series, but subsequent evolutions would have used it, according to Planetary Resources’ original plans. However, Chris Lewicki, president and chief engineer of Planetary Resources, told SpaceNews June 18 that the company has scaled back its ambitions for the optics package, which will likely now be a two-in-one instrument. Laser communications, Lewicki said after a June 18 public asteroid forum at NASA headquarters here, has been demoted to a nice-to-have feature, rather than a requirement. Planetary Resources unveiled itself to the world in April 2012 but was founded two years before, in 2010, as Arkyd Astronautics. The company has billionaire backing and counts among its supporters Google co-founder and Chief Executive Larry Page, and Ross Perot Jr., chairman of the Perot Group holding company and of Hillwood, that group’s real estate development company. Other investors include Google Executive Chairman Eric Schmidt and Charles Simonyi, the former Microsoft executive who twice visited the international space station on Soyuz flights booked through Space Adventures of Vienna, Va.
Branson, too, is now one of Planetary Resources’ “core” investors, according to a June 30 post on the company’s website. Planetary Resources also has said it would be willing to use a small-satellite launcher, Launch One, that Branson’s Virgin Galactic is developing, once that rocket is available. However, with Virgin Galactic’s core space tourism business not set to begin revenue operations until 2015, it could be a while before any Arkyd-100 telescopes are launched by their latest benefactor. Planetary Resources is run by co-chairmen Eric Anderson and Peter Diamandis, respectively chief executive officer of Space Adventures and chairman of the X Prize Foundation. The asteroid miners recently added Peter Marquez, former director of space policy for the White House National Security Council, to its roster. Marquez came to Planetary Resources from Orbital Sciences Corp. of Dulles, Va., which he left in December.